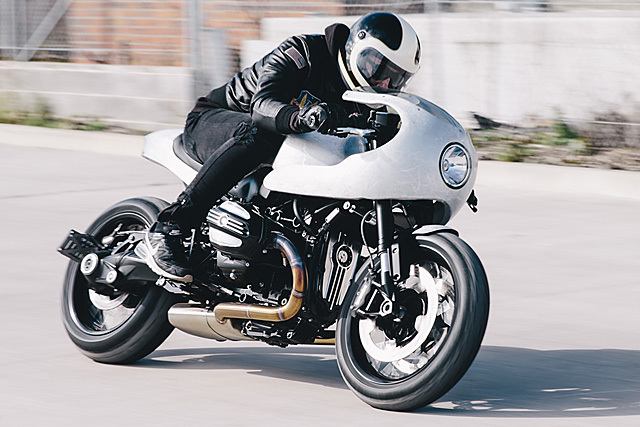 Ok, so maybe some beers were indeed drunk along the way, but having lost his custom Triumph the BMW gave him a second chance at motorcycle nirvana and not even a bad accident could put Stuart off riding again. 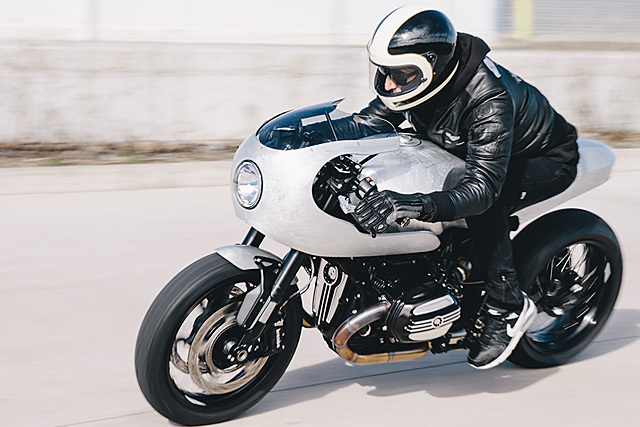 “I had a lot of time to think over this build, firstly I had to buy another motorcycle whilst I couldn’t walk – the irony was too much and it had to be done! 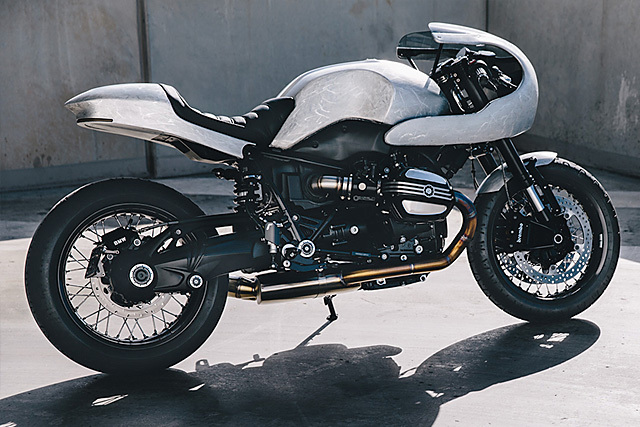 So a spanking new BMW R nineT was bought and delivered unannounced to Gasoline to kick off the excitement. They already knew this build wasn’t going to be a normal one. 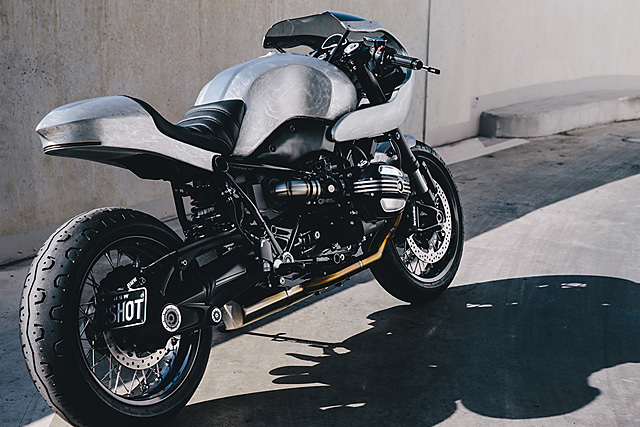 The R nineT was my second shot at the perfect motorcycle – hence 2shot.” The theme of the build would take on the feeling of resurrection as both man and machine came closer to be whole again. Perhaps with Confucius in mind Stuart also decided to make it a challenge “I also bizarrely wanted a difficult and lengthy build process” and the result is all kinds of good. 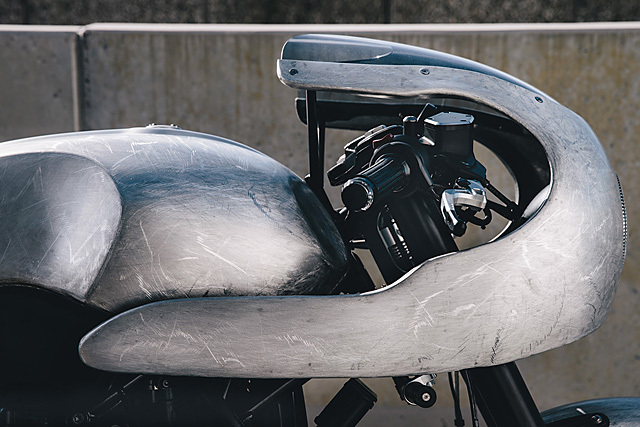 The finished result is incredible but rather than lay down coats of colour Stuart wanted a rough texture that gave the precision built bodywork a raw appearance as if fashioned from some post-apocalyptic materials. A coarse-cut file was used to give the effect, run over the alloy in different directions before layers of specially formulated matte finish clear coat were applied to protect the metal and give the grainy look a smooth touch. All this hard work would have gone to waste with lights and accessories spewing out all over the place so instead the latest in LED is used, frenched into the rear for a small but effective taillight/indicator combination. 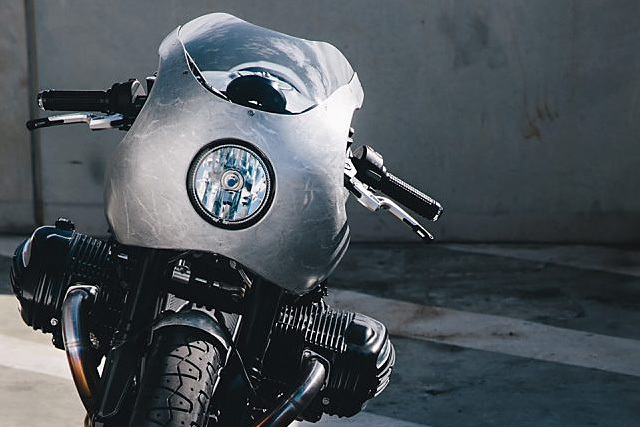 While upfront the LED Halo headlight gives the old school look utilising modern technology that recreates the feeling of an old R series racer down to the 9T. 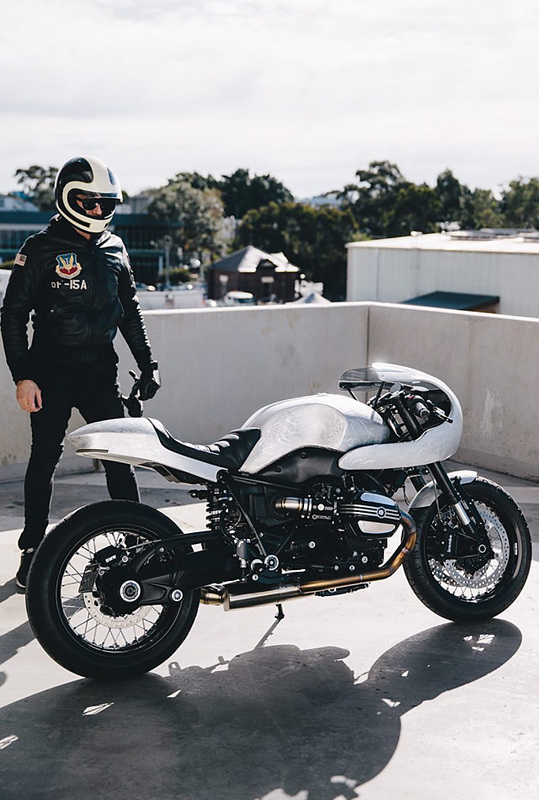 “With the amount of time and effort we put into the bike you can become emotionally attached” says Vaughan who along with Georgio have literally etched their soul into the machine. Back at Gasoline a fuel filler cap was designed and machined to fit into the new tank which further accentuates the overall industrial feel. The custom alloy seat pat built just for one was then covered in foam before being wrapped in black perforated leather and not a foot has been put wrong in keeping the lines flow from front to back. Keeping the bugs off Stuart’s face a custom impact resistant Perspex windshield was cut and fitted into the new fairing and the subtle tint works brilliantly with the alloy and black theme. That is further assisted with the front forks coming from the factory in gold now wearing new black anodizing and you start to appreciate the lengths to which Stuart has gone to ensure his BMW is exactly the way he wanted it to be. The factory’s blacked out Brembo’s clamp the dinner plate sized 320mm twin discs and even the lower legs have been given the murdered out treatment. 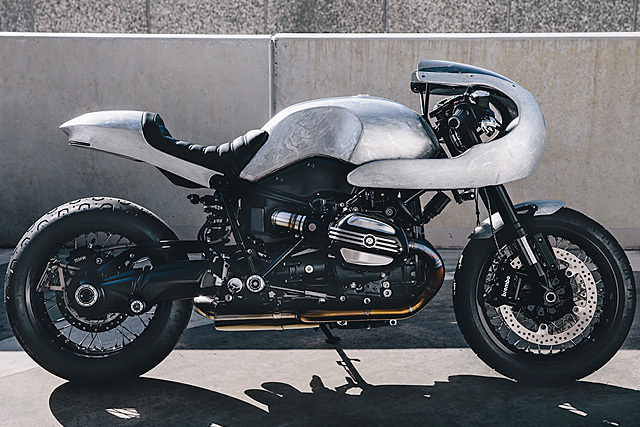 The engine in the nineT is the 1170cc Boxer twin that looks very much like the original R series units but with all the benefits of modern technology. It also happens to be considerably more powerful and with the right modifications Stuart has managed to squeeze even more ponies from the Bavarian brute. 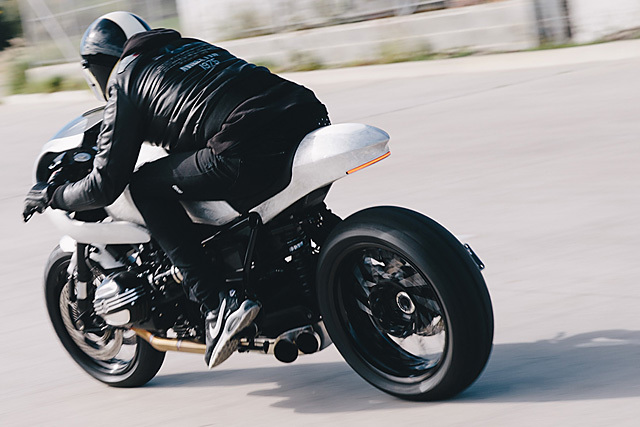 The most obvious of which is the stunning 2 into 1 exhaust system that merges in an underbox style muffler firing its flames sideways thanks to twin tips exiting just behind the side stand. Fabricated at the same time were a set of replacement inlet tracts that do away with the stock rubber units and feed the engine fresh gulps of air straight from the factory box. It’s already a beautiful engine to look at but it’s made even more impressive with RSD valve covers and billet machined RSD breast-plate for an old school hot rod grill appearance. With go and show now more than taken care of the final touches are all about ensuring the bike fits Stuart like a glove. A set of rearsets replace the factory pegs and allow for a sportier position on the bike and better feel clicking up through the gears. 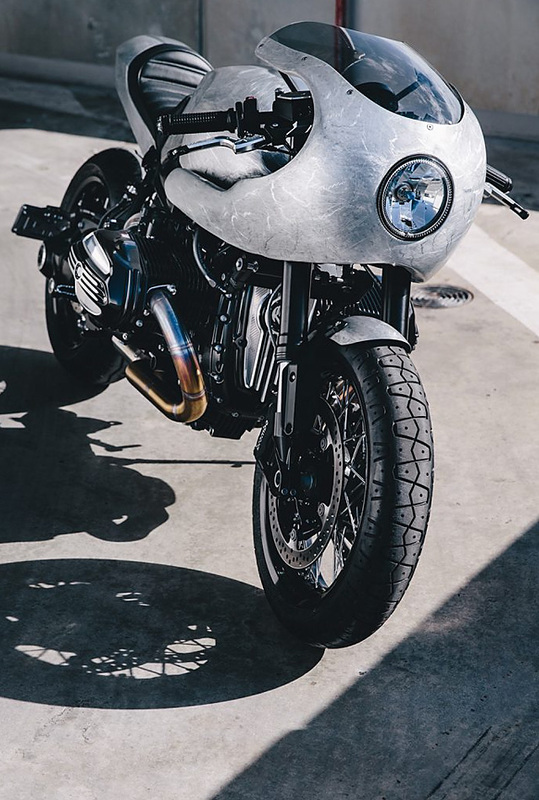 While replacing the factory bars with a set of clip-ons allows Stuart to tuck in behind the tinted screen when he really wants to get the BMW wound up. The riding position was no fluke, careful time and consideration was taken to ensure hands, feet and rear end were all positioned exactly right for the perfect rider feel. Thanks to a bunch of clever parts from the likes of Motogadget there is also the joy that comes from keyless start and stunning minimalist instrument gauge. Keeping everything legal on the Sydney streets those new clip-ons feature integrated bar end turn signals and a new number plate holder ensures the bodywork’s lines aren’t disturbed. 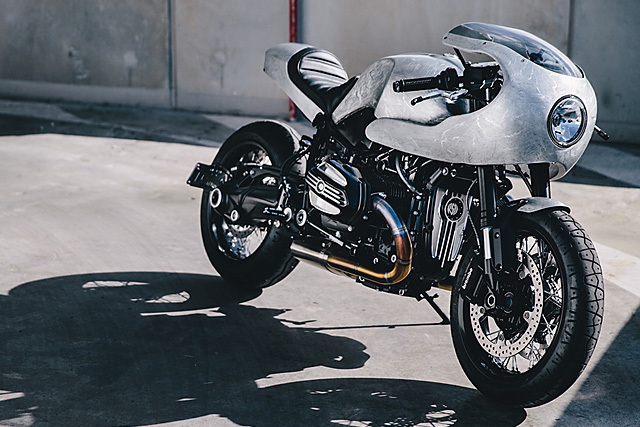 The lengthy build a result of both Stuart’s vision and the time it takes true craftsman to fashion such a design ensured that his war wounds have finally healed and the BMW can be ridden the way it deserves. It’s a hell of a thing to be knocked off your bike in such a brutal fashion but to bounce back not just as a rider but with an incredible machine to start the journey on again is a testament to the true biker in Stuart’s blood. So back to the wise old teacher who began our tale “Our greatest glory is not in never falling, but in rising every time we fall” and what a glory 2Shot is!